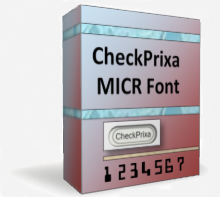 CheckPrixa MICR E13B Font is a special font that is developed for printing checks with a laser printer and magnetic ink. When printed in a high resolution printer (600 DPI and above), CheckPrixa's font produces high precision characters that are easily processed by most readers. It is a robust solution for users that require strong reliability in the printing process. With CheckPrixa's MICR E13B Font , you can easily automate check printing by incorporating the font into your existing infrastructure. A major advantage of CheckPrix's MICR E13B Font over many other font packages is that it can be embedded into PDF or XPS documents without requiring additional licenses. This is useful if you need to store your print-outs for review by approving authorities before actually printing them. You can also send the PDFs to another location to carry out the physical printing.